Boone as a member of the AAA Calgary Cannons in 1992. In 1992, Boone became the first-ever third-generation big-leaguer in baseball history. As a member of an All-Star family, he is the son of Bob, a catcher for the Philadelphia Phillies, California Angels and Kansas City Royals (1972–1990) and later a manager with the Royals and Cincinnati Reds; his brother Aaron is a third baseman who has played with the Reds, New York Yankees, Cleveland Indians, Florida Marlins,and Houston Astros. His grandfather Ray was an infielder for the Indians, Detroit Tigers, Chicago White Sox, Kansas City Athletics, Milwaukee Braves and Boston Red Sox (1948–1960). Boone started in the All Star Game in Seattle, received a Silver Slugger Award and finished third in the AL MVP voting. His Mariners paced the league with a record 116 wins, earning the AL West championship and advancing to the ALCS, tying the all-time team record for wins in a season with the 1906 Chicago Cubs. On January 4, 2006, Boone signed a minor league contract with the New York Mets. He received an invitation to spring training, but on March 1, only a few days into spring training, he announced his initial retirement from baseball, citing a lack of passion for the game. On February 18, 2008, Boone came out of retirement and signed a minor league contract with the Washington Nationals. At first he was assigned to the minor league camp, but after five days, he was invited to the team's major league spring training camp. ↑ Brown, David (July 13, 2012). "Answer Man: Aaron Boone talks television jobs, his famous family and cheap wine". Yahoo! Sports. Retrieved August 22, 2016. ↑ Will Grimsley (March 8, 1979). "Phillies 'Kiddie Korps' Enjoys Spring Romps". Spokane Daily Chronicle. ↑ David Schoenfield (September 12, 2011). "2001 Mariners: Best team that never won". ESPN.com. Archived from the original on October 20, 2011. Retrieved September 25, 2011. ↑ Marty Noble (March 1, 2006). "Bret Boone calls it a career". MLB.com. Archived from the original on May 18, 2008. Retrieved September 7, 2008. ↑ "Nationals sign three-time All-Star Bret Boone to Minor-League contract". MLB.com (Press release). February 18, 2008. Archived from the original on October 24, 2011. Retrieved September 7, 2008. ↑ Bill Ladson (February 23, 2008). "Boone joins big league camp". MLB.com. Archived from the original on June 5, 2012. Retrieved September 7, 2008. ↑ Ladson, Bill (March 20, 2008). "Nats reassign Boone to Minors". MLB.com. Archived from the original on March 27, 2008. Retrieved March 20, 2008. ↑ Bill Ladson (May 28, 2008). "After 14 major league seasons, retiring Boone in a better place". ESPN.com. Archived from the original on February 14, 2012. Retrieved September 7, 2008. ↑ Hickey, John (February 18, 2005). "Bret Boone on steroids? 'No chance,' he says". Seattle Post-Intelligencer. Archived from the original on October 5, 2012. Retrieved April 20, 2010. ↑ "Spring Training 2001". Sports Illustrated. CNN. February 3, 2001. Archived from the original on April 7, 2014. Retrieved February 4, 2013. ↑ Jeff Merron. "And the real facts are...". ESPN.com. p. 2. Archived from the original on April 7, 2014. Retrieved May 29, 2013. ↑ "José Canseco". Baseball-Reference.com. Archived from the original on January 26, 2013. Retrieved February 4, 2013. 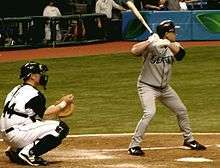 Wikimedia Commons has media related to Bret Boone.